You get the picture. 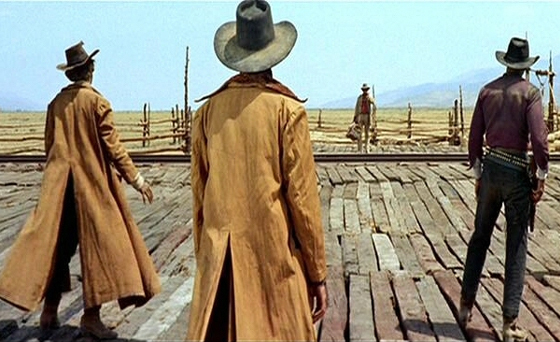 Some of the most iconic movie images of the American West came to us from the imagination of the late Italian film director, Sergio Leone. (Think: Clint Eastwood as The Man with No Name.) As someone who did not have much direct experience in America, what did Mr. Leone know about us that we did not know ourselves? Most of what he knew about America came from Hollywood movies, many of them Westerns and it is this genre that he used to tell his American stories of rugged individualism on the frontier, the struggle of good versus evil, and the promise of a better life in a new land. In my mind, his Westerns can hold their own with those of John Ford and Howard Hawks, two of America’s greatest directors. How lucky for us that Leone’s classmate in school was the great composer, Ennio Morricone. His spare, haunting music echoes through the empty desert as the perfect complement to Leone’s lonely, wide-angle landscapes. This is not grand opera. It is the sound of an unforgiving landscape, stripped down to its bare bones. Even without seeing them, we know that the vultures are circling. Sometimes it is not ourselves but the outsider who sees us as we are. Leone’s vision of the promise of America may not have been much different from that of my Nonno and Nonna, who came here so many years ago to find a better life. And when this Italian American granddaughter watches a Leone western, she feels right at home.